Playcraft was founded in 1975 by two people named Mel and Herb. They wanted to found a company that developed a line of game room products with a base of American workmanship and value for their customers. 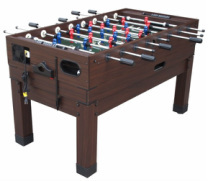 They started out slow with a single product and expanded the business into a full product line that now includes much more than their two foosball table models. They became popular among business customers such as schools, hospitals, military and other institutions early on. Playcraft now is also popular in the home recreation market and now makes air hockey, arcade, bumper pool, shuffleboard, ping pong and more. 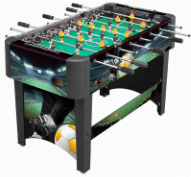 In terms of their foosball product line, they have progressively gotten better at manufacturing them and continued to expand their product line. Their different models are featured below and they offer a solid range of different models for various types of players. Their Extera offers a model that can be used in the outdoors. While they are an American company, they offer a Milan that is mimicked after the European game style. Then there is the Danbury that is a multi-game table that allows you to pack 14 games in 1. The Pitch is your classic every day model that you really can't go wrong with. And, finally, the Sport is made for teenagers and kids and offers a lower price point.